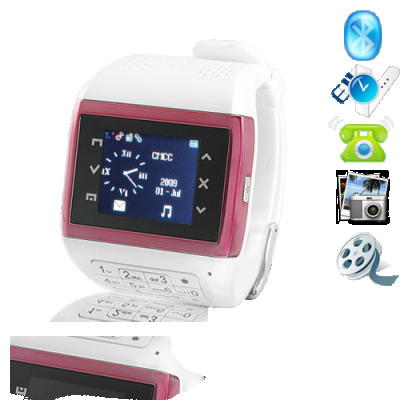 Successfully Added Lady Jaguar - Quad Band Touchscreen Mobile Phone Watch + Keypad to your Shopping Cart. The Lady Jaguar is based on our popular Jaguar mobile phone wrist watch. Just like its predecessor, the Lady Jaguar also merges communication and music entertainment into one superb wrist watch cellphone. Coming with a single SIM card slot, 1GB of memory and a full keypad to make this wristphone very easy for anyone to use. The Lady Jaguar is a newly designed mobile phone watch that has been enhanced with customer requested features such as 4-band GSM and a numeric keypad to make this one of the best digital wrist watch mobile phone on the market today! The Lady Jaguar supports the four global standard GSM frequencies (850MHz, 900MHz, 1800MHz, 1900MHz) so you can be confident that it will work anywhere around the world. This cellphone watch comes fully unlocked, meaning you can you use it with the network of your choice. Let's not forget, this is still a fully functioning digital watch with time, date and day display with programmable alarms and to do lists for keeping you on schedule and in style. The CVLP-M63 (a.k.a. The Lady Jaguar) is built with onboard speakers that let you hear your callers voice loud and clear without the need for earphones. The touch screen interface comes with touch sensitive icons and is carefully calibrated to help make navigating through this mobile phone watch fast and efficient. The Lady Jaguar is also provided with a Bluetooth headset and a pair of earphones if you need them, and also includes TWO high capacity lithium-ion rechargeable batteries, making this a complete communication tool for use as soon as you open the box. This magnificent combo cellphone and wrist watch is available for single and bulk purchases. It is in stock in our warehouse right now, so order yours today at our incredible factory direct wholesale price and we will ship it out to you tomorrow! Quad Band - use this around the world! Before you insert the micro SD card, switch off the mobile phone wrist watch, insert the micro SD card and then switch the cellphone wrist watch ON. i am very impressed with the watch and the great service i got. thanks you. on 2009-11-23 23:31:25 THIS GADGET IS AWESOME!! !